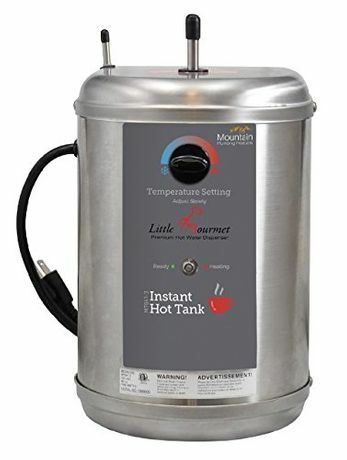 Superwater.com offers 100% FREE FedEx and UPS Ground Shipping on every Mountain MT641-3 / MT6413 "The Little Gourmet" aka NEW FOR 2017 Little Gourmet� Premium Hot Water Tank- "Trim Out" Heating Tank REPLACES THE OLDER MODELS # MAH-780-UL & # DH14-00868 Order. IMPORTANT: The NEW # MT641-3 "Little Gourmet Premier" Heating Tank you are currently viewing is designed to be used only with approved Mountain Plumbing Products including Hot Water Dispensers, and Hot & Cold Water Dispenser Faucets. Mountain Faucets are available in numerous designer finishes. The Little Gourmet MT641 Heating Tank produces 190 Degree Water At Your Fingertips. It is able to deliver up to 60 cups of water per hour of instantly hot water. This product is great for cooking, making instant coffee, tea or for a variety of uses in a wet bar. Fingertip temperature control is adjustable to personal taste, between 140 and 200 degrees. The MT641 Heating Tank uses less energy than it takes a 40 watt light bulb to heat and costs under $2.00 per month to operate, making it convenient and affordable. 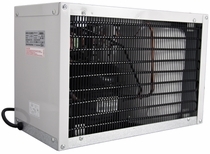 The 780 watt heater offers faster recovery time compared to competitive brands. Compact design features a 5/8 gallon reservoir and installs very easily under your sink. The self setting thermal fuse interior protects the heater element and thermal fuse in the event of a dry start up. Easy to install Quick-Connect fittings and improved connections reduce probability of kinked or twisted water lines. PLEASE NOTE: Compatible Mountain Faucets are all HOT Mountain Faucets & all of the HOT/COLD Plumbing Product Models. Due to a change in Product Distribution through Mountain Plumbing Products.